After development that started here in 2007, the Southeastern Climbers' Coalition (SCC) have partnered with several non-profits to keep this area open to climbers as well as to preserve the areas biological and conservation values. 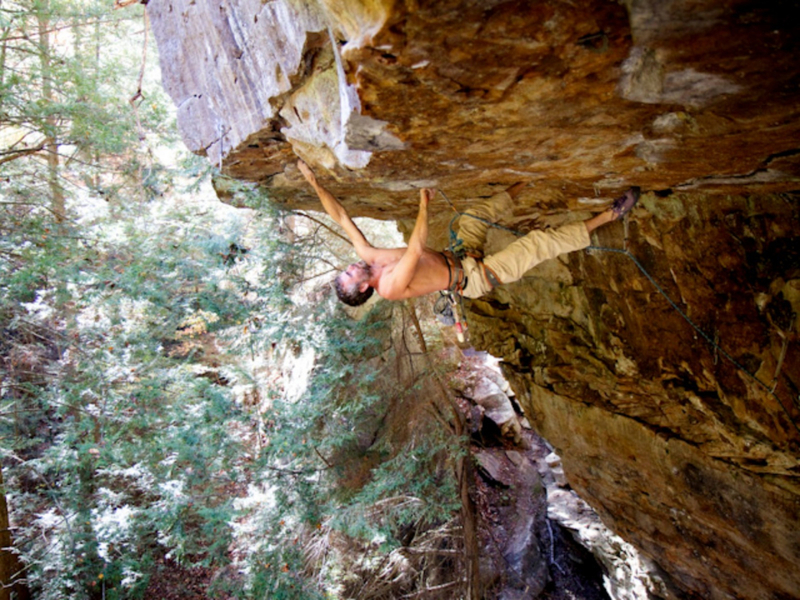 Deep Creek is perfect for climbing long, steep lines through some of the Southeast's best sandstone. Located on the Cumberland Trail, Deep Creek's cliff line of picturesque rock backs up to the confluence of two creeks: Big Soddy Creek and Deep Creek. Here, there are plenty of swimming holes to jump in on the hottest days. The season at Deep Creek is fickle (and during the best climbing temps it is often wet); it is a good late spring, summer, and early fall crag. Deep Creek's original main wall could be called the "Land of the 5.12". Stacked with sport routes of this grade that scale the overhanging and slopey rock.Climbing the unique routes Cool Watas' (5.12d) and Dunking Booth (5.12c), as the names suggest, you may get a bit wet. Whether it's from being lowered from Cool Watas' or while getting dunked while failing on the burly roof of Dunking Booth, is up to you. In recent years, development of the area has increased the number of routes and grade range with a handful of moderates. 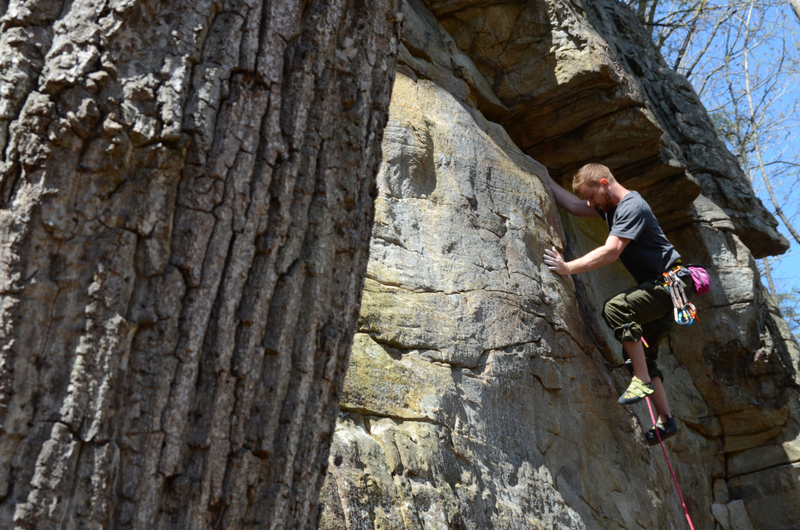 5.10+ climbers that love over-hanging routes with great features. Currently there is space for 26 vehicles in the lot and if the lot is full, please visit another area. The parking lot is gated with a lock. To obtain the code, please visit the SCC website. From the parking lot, the trail is obvious at the far back left corner of the lot near the kiosk. You'll wind down the trail and hike down steep rocks towards the water. Cross here on the newly built bridge and hike back up the trail to the cliff line; it's about 15-20 minutes from the car. No camping of any kind is allowed here and the parking area is only open between the hours of 6am and 10pm. Wild Trails/Triple Crown Bouldering Series, Cumberland Trail Conference, The Access Fund, Carolina Climbers Coalition and Friends of Cumberland Trail partnered with the Southeastern Climbers' Coalition (SCC) to purchase the parking area. Please respect the rules to continue this partnership. The land is owned by the Tennessee Dept. of Environment and Conservation Land, which makes it state land. Please be respectful of the area and follow the rules. Do not leave quickdraws overnight. No bolting without a permit. To obtain a permit, contact John Dorough at jwdorough@comcast.net or Chad Wykle at chad@rockcreek.com. Please remember that proper and respectful use of the land allows us to climb here.